Background: Ginsenosides are the principal components responsible for the pharmacological activities of ginseng. Ginsenosides Rg1 and Rb1 are the major compounds recognized as marker substances for quality control of ginseng-based products. These major compounds can be transformed to several pharmacologically active minor ginsenosides by chemical, microbial, and enzymatic means. Materials and Methods: In the present study, a combination of polysaccharide hydrolases and high hydrostatic pressure (HHP) were used to extract ginseng saponins enriched with ginsenosides Rg1 and Rb1. Temperature, pH, time, ginseng-to-water ratio, and pressure were optimized to obtain the maximum amount of Rg1 and Rb1 in the resulting extract using commercial polysaccharide hydrolases. Results: This study showed that treatment with a combination of cellulase, amylase, and pectinase at 100 MPa pressure, pH 4.8, and 45°C for 12 h resulted in higher Rg1 and Rb1 levels in the extract. Conclusion: This study describes a cheap and ecofriendly method for preparing ginseng extract enriched with Rg1 and Rb1. Extract of Panax ginseng C.A. Meyer (ginseng) is used as traditional herbal medicine in East Asian countries. The main bioactive components of ginseng are steroidal saponins called ginsenosides, more than 40 of which have been identified. The most abundantly occurring ginsenosides are Rg1, Re, Rb1, Rc, Rb2, and Rd, which accounts for about 90% of the saponin content in ginseng roots. Ginsenosides fall under three major chemical categories, namely, glycosides of protopanaxadiol (PPD-type ginsenosides), glycosides of protopanaxatriol (PPT-type ginsenosides), and oleanane-type ginsenosides. Rg1 and Rb1, from which other ginsenosides can be produced through transformation, are the most abundant in ginseng roots and vary among several ginseng varieties and ginsengs from various geographical locations. Ginsenosides Rg1 and Rb1 are reported to stimulate melanogenesis. Additionally, ginsenoside Rb1 was reported to have anti-obesity and anti-hyperglycemic effects, ameliorate insulin resistance, modulation of vascular function, protection against myocardial infarction after ischemia and reperfusion, prevention of cardiac injury in diabetes induced by streptozotocin, and reduce body weight. However, ginsenoside Rg1 was shown to suppress hepatic glucose production in HepG2 cells. Furthermore, ginsenoside Rg1 was shown to have antidepressant-like activity. Furthermore, both Rb1 and Rg1 were reported to have anti-amnestic and anti-aging activities. These compounds were also reported to have anti-lipid peroxidative activity. Ginsenosides Rb1 and Rg1 are the most extensively studied among all the ginsenosides from ginseng, which has been reviewed recently. These bioactivities of ginsenosides Rg1 and Rb1 make these compounds of specific interest when preparing ginseng products. Ginseng products have been approved as functional foods by the Korean Food and Drug Administration (KFDA) and has been formulated into a variety of health products, which are marketed in the Asian and other countries around the world. The KFDA regulations states that ginseng products should contain approximately 10-13 mg of ginsenosides for a 70-mg saponin content and that products should exactly label the contents of Rb1 and Rg1, which are accepted as marker substances for quality control around the world. The joint FAO/WHO Codex Alimentarius Commission adopted the Asian regional standard to ensure the quality of ginseng products. The Commission has approved the use of ginsenosides Rb1 and Rg1 as the worldwide standard for quality control of ginseng products used as a food or food ingredient. Traditionally, saponin extraction involved hot extraction of plant materials with an aqueous alcoholic solution, which result in artifacts of ginsenosides and lower extraction of Rg1 and Rb1. Furthermore, use of methanol for extraction of steroidal saponins may result in the formation of methyl derivatives. The traditional method of soxhlet extraction with organic solvents is time consuming and employs large amounts of solvent, which require evaporation and concentration and also pose problems during waste disposal. Recently, several novel methods have been employed for the extraction of phytochemicals, which include cell-wall degrading enzymatic extraction and high hydrostatic pressure (HHP) extraction. Both these methods reduce the operating temperature and minimize compound degradation or production of artifacts. These methods can be scaled up for mass production, low cost, reduce environmental pollution and are non-hazardous to working personnel. In the present work, we optimized conditions for preparation of ginseng extract enriched with Rg1 and Rb1 by a combination of HHP and enzymes (HHP-E). Freshly harvested Korean ginseng (P. ginseng C.A. Meyer) roots cultivated in Geumsan (6- and 4-year-old) and in Punggi (4-year-old), Korea, were used in this study in order to find the suitable material for higher ginseng saponin yield. The ginseng roots were washed, cut into small pieces, and homogenized in sterile distilled water. The homogenate was filled in flexible polypropylene tubes and subjected to HHP treatment at 50 MPa for 24 h at 25°C in an HHP machine (TFS-2L, Toyo-Koatsu Innoway Co. Ltd., Hiroshima, Japan). Simultaneously, the ginseng homogenate was also incubated at atmospheric pressure (AP, 0.1 MPa) for 24 h at 25°C. After HHP and AP treatments, the homogenate was centrifuged and the supernatant was used for analysis of total saponin content. Ginseng homogenate was subjected to various high-pressure conditions such as 25, 50, 75, 100, and 110 MPa to optimize the pressure for maximum saponin recovery and the total saponin yield was compared with AP treatment for 24 h. In order to find a suitable concentration of fresh ginseng in water for maximum saponin yield, various concentrations (such as 2, 5, 10, 15, 20, and 25%) of ginseng were homogenized in water and subjected to 100 MPa treatment for 24 h. Extraction duration was optimized by incubating the ginseng homogenate for 12, 18, and 24 h at 0.1 and 100 MPa pressure. After incubation in the above-mentioned conditions, the ginseng homogenate was centrifuged and the supernatant was used for analysis of total saponin content. In order to determine whether addition of cell wall-degrading enzymes and treatment with HHP increase ginseng saponin yield, several commercially available polysaccharide hydrolases were used, such as cellulase (from Trichoderma reesei ATCC26921-Sigma C2730), α-amylase (from Bacillus licheniformis-Sigma A3403), Viscozyme L. (mixture of polysaccharide hydrolyzing enzymes-Sigma V2010), and pectinase (from Aspergillus aculeatus-Sigma P2611). Two units of each enzyme (E) separately and in combination were used together with HHP of 100 MPa (HHP-E) for 24 h at 25°C. Enzyme treatment was also done at AP for 24 h at 25°C. After incubation, the ginseng homogenate was centrifuged and the supernatant used for the analysis of total saponin content. Optimum pH for enzyme reaction under HHP condition was determined by subjecting the ginseng homogenate to various pH of 4, 4.5, 4.8, and 5 adjusted with 2 M citric acid and 5.5, 6, 6.5, and 7 with 2 M trisodium citrate. The suspension was added with various enzymes as given in [Table 1] and subjected to 100 MPa pressure treatments for 12 h at 25°C. 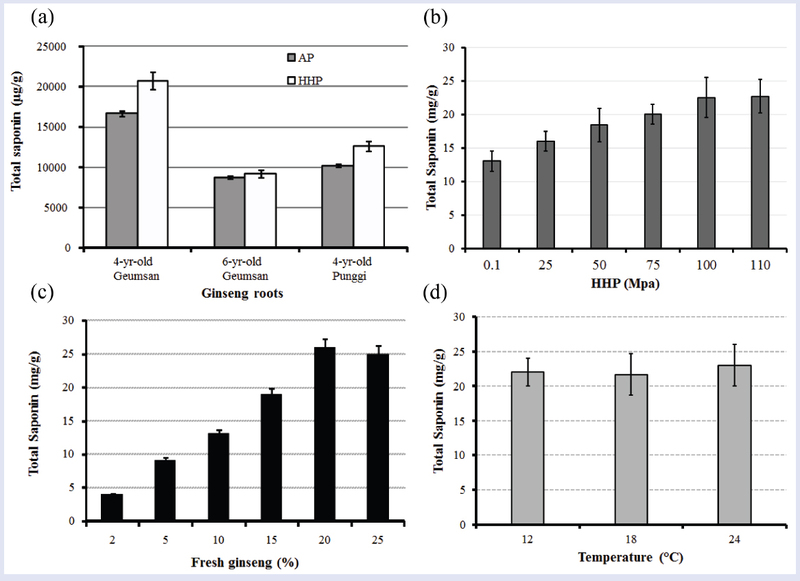 For the optimization of temperature, the ginseng suspension added with various enzymes was subjected to 100 MPa treatments at various temperatures of 25, 28, 32, 37, 40, 45, 50, 55, and 60°C to identify the optimum temperature for HHP-E treatment to obtain maximum ginsenoside recovery. The ginsenoside contents were analyzed by High Performance Liquid Chromatography (HPLC). The ginseng homogenate prepared as described above from 4-year-old Geumsan ginseng roots was subjected to enzyme combinations [Table 1] to determine which combination results in extraction of equal ratio of Rg1 and Rb1 at optimum pressure, pH, temperature, and time duration. After treatment, the ginseng homogenate was centrifuged and the supernatant was used for HPLC analysis. Total saponin content was estimated according to the procedure described in another study. One hundred microliter of each sample was made up to 0.25 mL with aqueous methanol (80%) and 0.25 mL of 8% vanillin reagent and 2.5 mL of 72% sulfuric acid were added to the inner side of the tubes. The solutions were mixed well and the tubes incubated at 60°C in a water bath for 10 min. After incubation, the tubes were allowed to cool to room temperature and the absorbance was measured at 544 nm against the reagent blank. A standard curve was prepared using various concentrations of diosgenin (Sigma) as the standard saponin. The standard saponin solution was prepared in 80% aqueous methanol. Reagent blank contained 0.25 mL aqueous methanol (80%) instead of samples. The ginseng extracts from HHP and AP were mixed with equal volumes of n-butanol and shaken for 20 min at room temperature. The mixture was centrifuged at 13,000g for 5 min for phase separation. The butanol phase was then collected and dried in a vacuum evaporator and the dried extract was dissolved in methanol and used for HPLC analysis. HPLC analysis was done according to our previous report. Briefly, analyses were performed in a Waters HPLC system using a C18 column (Sunfire, 4.5 mm × 25 cm). HPLC-grade acetonitrile (mobile phase A) and water (mobile phase B) were used. The analyses were performed with a mobile phase flow rate of 1 mL/min using a solvent gradient as follows: 0-8 min, 20-30% A; 8-12 min, 30-40% A; 12-15 min, 40-65% A; 15-20 min, 65-100% A; 20-30 min, 100% A; 30-35 min, 100-30% A; 35-40 min, 30-20% A. The column was equilibrated with 20% A for 5 min between sample injections. The column was injected with 20 μL of samples using an automated sample injector. The elution of various ginsenosides was monitored at 203 nm. The quantity of the ginsenosides Rg1 and Rb1 was determined by comparison with the chromatogram of a standard ginsenosides Re, Rg1, Rb1, Rf, Rc, Rb2, Rb3, Rg2, Rh1, Rd, Rg3, Ck, and Rh2 mixture (Sigma). HPLC analysis of each sample was performed in triplicates to obtain confirmatory results. All the experiments were performed three times. The mean values of each experiment were compared using Tukey test using SPSS version 19 (IBM SPSS Statistics). 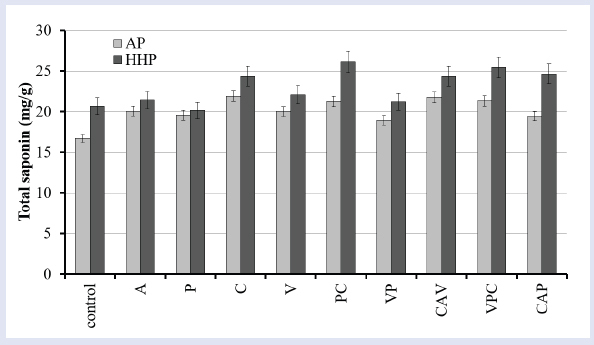 High amount of total saponin yield was observed in 50-MPa treatment of 4-year-old Geumsan ginseng compared with AP and HHP treatments of other ginsengs [Figure 1]a. Furthermore, detailed analysis of total saponin content in various HHP conditions indicated that 100-MPa treatment was efficient in increasing saponin yield in ginseng extract [Figure 1]b. The optimum fresh ginseng concentration for HHP treatment was observed to be 20% [Figure 1]c. Furthermore, HHP treatment of ginseng homogenate did not show significant difference in total saponin level in various time points used in this study [Figure 1]d, which indicated that incubation for a minimum of 12 h is sufficient. Furthermore, study of HHP-E showed that treatment with HHP-E increased the total saponin content than treatment with either HHP, AP, or AP-E for the enzymes cellulase (C), pectinase + cellulase (PC), cellulose + amylase + viscozyme (CAV), viscozyme + pectinase + cellulase (VPC), and cellulose + amylase + pectinase (CAP). However, no significant difference in total saponin content was observed among these enzyme treatments under HHP incubation [Figure 2]. 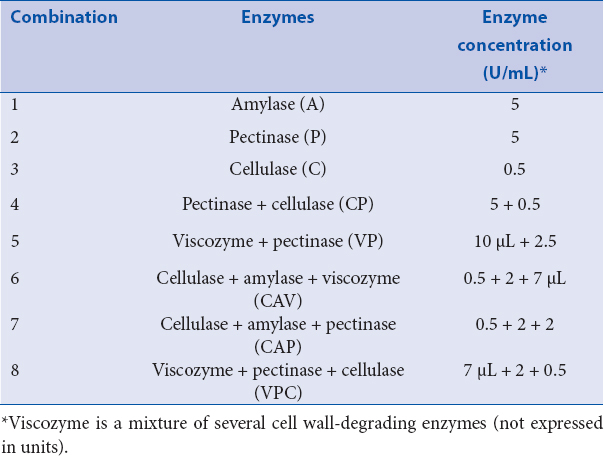 The optimum pH for maximum ginsenoside recovery was observed to be pH 4.8 under HHP-E condition using enzymes such as cellulase, α-amylase, pectinase, and viscozyme L [Figure 3]a. Optimum temperature for HHP-E treatment was determined to be 45°C for the various enzymes for maximum ginsenoside recovery [Figure 3]b. 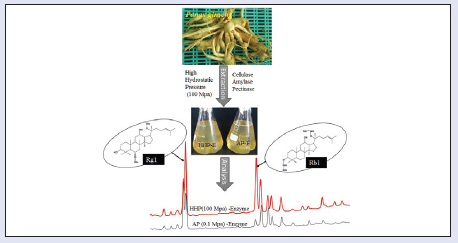 Specific ginsenoside content in HHP-E-treated ginseng roots in comparison with HHP, AP, and AP-E was analyzed by HPLC. 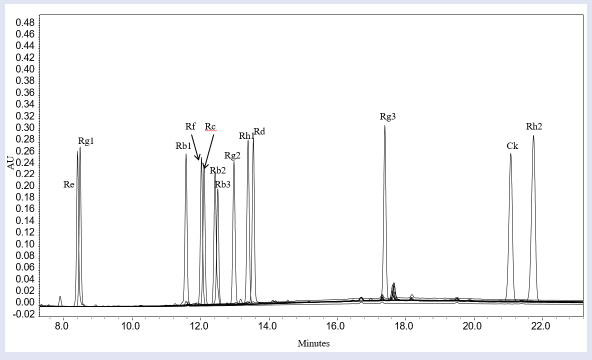 HPLC separation of a mixture of standard ginsenosides (Re, Rg1, Rb1, Rf, Rc, Rb2, Rb3, Rg2, Rh1, Rd, Rg3, Ck, and Rh2) is given in [Figure 4]. HHP of 100 MPa and enzymatic treatment significantly (P < 0.05) increased the yield of ginsenosides Rg1 + Rb1 when compared with enzymatic treatment at AP (0.1 MPa) [Figure 5]. 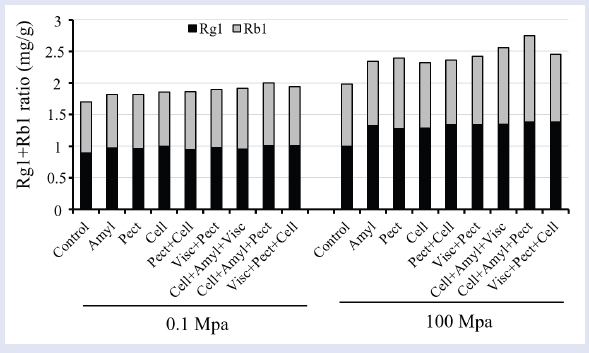 The contents of ginsenosides Rg1 and Rb1 in fresh ginseng root extracts treated with three enzymes such as cellulase, amylase, and pectinase and their combination CAP under 100 MPa were significantly higher (P < 0.05) than those of samples treated with enzymes at AP (0.1 MPa) [Figure 5]. 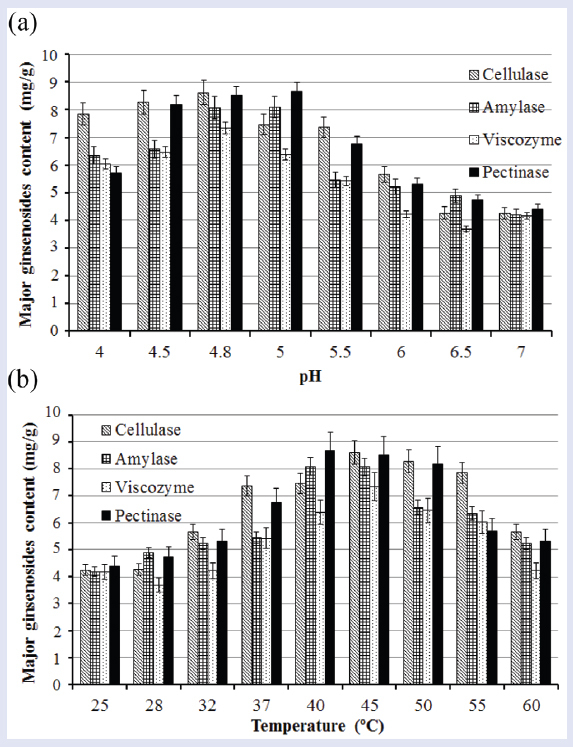 Ginseng samples without enzymatic treatment (control) showed a 16.8% increase in ginsenosides, from 1.69 (0.1 MPa) to 1.98 mg/g (100 MPa), which was significantly different (P < 0.05) [Figure 5]. A combination of the three enzymes (CAP) along with high pressure (100 MPa) produced the highest yield (P < 0.05) compared with the individual enzymes (C, A, and P) or other combinations (CP, VP, CAV, and VPC). The yield of ginsenosides Rg1 and Rb1 obtained by using a combination of the three enzymes CAP and HHP was 2.74 mg/g, representing 17.3, 14.6, 18.3, 16.4, 13.5, 7.4, and 11.9% increase over enzymes alone or in combinations (2.34, 2.39, 2.32, 2.36, 2.42, 2.55, and 2.45 mg/g for A, P, C, PC, VP, CAV, and VPC, respectively). Two-enzyme combinations did not show a significant increase in Rg1 + Rb1 content compared with the yield of single enzyme [Figure 5]. Mature ginseng roots are harvested about 4–6 years of age for the preparation of ginsenosides. Ginseng cultivation is restricted to specific geographic regions due to its extremely specific soil and moisture requirement. Ginsenoside quantity and composition of ginsengs from different geographical regions and age varies significantly., Hence, our study was focused initially on selecting a suitable starting material for the preparation of ginseng extracts enriched with ginsenosides Rg1 and Rb1. Based on the optimization of extraction conditions and yield of total saponins, 4-year-old Geumsan ginseng roots were selected. HHP is a food-processing technology; however, it has been used in recent times for the extraction of bioactive components from plant materials. High pressure-treated red ginseng showed a 45% higher level of total major ginsenosides than conventionally prepared red ginseng. However, Jun (2013) used very high pressure of 400-600 MPa. HHP of more than 300 MPa was reported to cause denaturation of enzymes., Since our goal is to combine HHP and polysaccharide hydrolase enzymes for extraction of ginsenosides, such high pressure could not be used in this study. In our study, we observed that longer incubation at a relatively lower HHP, that is, 100 MPa is sufficient for the release of total saponin from ginseng tissue [Figure 1]b. High-pressure processes are isostatic and adiabatic, which causes uniform and instant transmittance of pressure regardless of the shape and size of the material to be processed. This could be the reason that we did not observe a significant difference in total saponin yield upon long duration of incubation of ginseng homogenate at HHP. Cell wall-degrading enzymes such as cellulase, pectinase, and viscozyme can break down the plant cell wall and facilitate the release of bioactive compounds. Enzymes such as α-amylase from Bacillus sp. and several commercial cellulases from various microbes show increased activity at HHP of 100 MPa.,, A combination of HHP and enzymes was shown to increase the recovery of ginsenoside Rd in our previous study. pH optimization was done to determine a suitable pH for using enzyme combinations for extraction of ginsenosides from ginseng tissue. pH and temperature are the most critical factors, as they significantly affect enzyme activities. Temperature influences the viscosity of the medium and higher temperature can cause compound decomposition. High pressure is known to increase temperature, and the actual optimum temperature for enzyme activity might change at high pressure. Hence, we optimized the temperature for enzyme activity at 100 MPa for the extraction of ginsenosides. The use of the enzyme combination CAP and high pressure was found to be the best condition for increasing the yield of ginsenosides Rg1 and Rb1. The reason for higher extraction of Rg1 and Rb1 in the three-enzyme combination CAP could be due to the enhanced activity of cellulase and amylase at HHP as reported earlier. Additionally, HHP was reported to disrupt ginseng cells and release the starch materials;, hence treatment with cellulase and amylase hydrolyze the cellulose in the cell wall and starch released from the cells, respectively, to facilitate higher release of ginsenosides. We observed, in our previous study, that treatment with cellulase converts ginsenoside Rb1 to Rd. Hence, in this study, we used minimal amount (0.5 U) [Table 1] of cellulase to avoid Rb1-to-Rd conversion, which could result in low yield of ginsenoside Rb1. Pectinase is another cell wall-degrading enzyme, which hydrolyze pectin in the cell wall. This enzyme was also previously reported to enhance the yield of ginsenoside Rg1 from red ginseng. The observation of high amount of Rg1 + Rb1 in the three-enzyme combination CAP could be due to the synergistic effect of these enzymes. The HHP-E conditions used in this study (a combination of 100 MPa and enzymes cellulase, amylase, and pectinase) allowed the efficient extraction of ginsenosides Rg1 and Rb1 from fresh ginseng roots under optimized temperature and pH. This HHP and enzyme treatment technique is ecofriendly and a green approach for extraction of phytochemicals from various plant sources. A grant from the Next-Generation BioGreen 21 Program (no. PJ01133402),Rural Development Administration, Republic of Korea, supported this work. Bae EA, Shin JE, Kim DH. Metabolism of ginsenoside Re by Human intestinal microflora and its estrogenic effect. Biol Pharm Bull 2005;28:1903-8. Ruan CC, Liu Z, Li X, Liu X, Wang LJ, Pan HY, et al. Isolation and characterization of a new ginsenoside from the fresh root of Panax ginseng. Molecules 2010;15:2319-25. Chen R, Meng F, Zhang S, Liu Z. Effects of ultrahigh pressure extraction conditions on yields and antioxidant activity of ginsenoside from ginseng. Sep Purif Technol 2009;66:340-6. Wang J, Gao WY, Zhang J, Zuo BM, Zhang LM, Huang LQ. Advances in study of ginsenoside biosynthesis pathway in Panax ginseng C. A. Meyer. Acta Physiol Plant 2012;34:397-3. Lin M, Zhang BX, Zhang C, Shen N, Zhang YY, Wang AX, et al. Ginsenosides Rb1 and Rg1 stimulate melanogenesis in human epidermal melanocytes via PKA/CREB/MITF signaling. Evid Based Complement Alternat Med: eCAM 2014:892073. Xiong Y, Shen L, Liu KJ, Tso P, Xiong Y, Wang G. et al. Antiobesity and antihyperglycemic effects of ginsenoside Rb1 in rats. Diabetes 2010;59:2505-12. Shang WB, Yu XZ, Wang GQ, Zhao J. Effect of ginsenoside Rb1 in ameliorating insulin resistance and ectopic fat deposition in obese mice induced by high fat diet. Zhong Zhong Yao Za Zhi 2013;38:4119-23. Papapetropoulos A. A ginseng-derived oestrogen receptor beta (Erbeta) agonist, Rb1 ginsenoside, attenuates capillary morphogenesis. Br J Pharmacol 2007;152:172-4. Wang Z, Li M, Wu WK, Tan HM, Geng DF. Ginsenoside Rb1 preconditioning protects against myocardial infarction after regional ischemia and reperfusion by activation of phosphatidylinositol-3-kinase signal transduction. Cardiovasc Drugs Ther 2008;22:443-52. Wu Y, Xia ZY, Dou J, Zhang L, Xu JJ, Zhao B, et al. Protective effect of ginsenoside Rb1 against myocardial ischemia/reperfusion injury in streptozotocin-induced diabetic rats. Mol Biol Rep 2011;38:4327-35. Lin N, Cai DL, Jin D, Chen Y, Shi JJ. Ginseng panaxoside Rb1 reduces body weight in diet-induced obese mice. Cell Biochem Biophys 2014;68:189-94. Kim SJ, Yuan HD, Chung SH. Ginsenoside Rg1 suppresses hepatic glucose production via AMP-activated protein kinase in HepG2 cells. Biol Pharm Bull 2010;33:325-8. Jiang B, Xiong Z, Yang J, Wang W, Wang Y, Hu Z, et al. Antidepressant-like effects of ginsenoside Rg1 are due to activation of the BDNF signalling pathway and neurogenesis in the hippocampus. Brit J Pharmacol 2012;166:1872-87. Cheng Y, Shen LH, Zhang JT. Anti-amnestic and anti-aging effects of ginsenoside Rg1 and Rb1 and its mechanism of action. Acta Pharmacol Sin 2005;26:143-9. Deng HL, Zhang JT. Anti-lipid peroxilative effect of ginsenoside Rb1 and Rg1. Chin Med J (Engl) 1991;104:395-8. Lee CH, Kim JH. A review on the medicinal potentials of ginseng and ginsenosides on cardiovascular diseases. J Ginseng Res 2014;38:161-6. Kim IW, Cha KM, Wee JJ, Ye MB, Kim SK. A new validated analytical method for the quality control of red ginseng products. J Ginseng Res 2013;37:475-82. Joint FAO/WHO Codex Alimentarius Commission Proposed draft standard for ginseng products (conversion of the regional standard for ginseng products to a worldwide standard), (Agenda Item 5), ftp://ftp.fao.org/codex/reports/reports_2015/REP15_PFVe.pdf. Oleszek W, Bialy Z. Chromatographic determination of plant saponins–an update (2002-2005). J Chromatogr A 2006;1112:78-91. Wang L, Weller CL. Recent advances in extraction of nutraceuticals from plants. Trends Food Sci Technol 2006;17:300-12. Palaniyandi SA, Damodharan K, Lee KW, Yang SH, Suh JW. Enrichment of ginsenoside Rd in Panax ginseng extract with combination of enzyme treatment and high hydrostatic pressure. Biotechnol Bioproc Eng 2015;20:608-13. Wei SE, Isolation and determination of anti-nutritional compounds from root and shells of Peanut (Arachis hypogaea). Universiti Tunku Abdul Rahman, Selangor, Malaysia;2011. Biswas T, Ajayakumar PV, Mathur AK, Mathur A. Solvent-based extraction optimisation for efficient ultrasonication-assisted ginsenoside recovery from Panax quinquefolius and Psikkimensis cell suspension lines. Nat Prod Res. 2015;29:1256-63. Xiao D, Yue H, Yang X, Sun X, Wang Y, Liu S, Accumulation characteristics and correlation analysis of five ginsenosides in Panax ginseng with different cultivation ages from different regions. J Ginseng Res 2015;39:338–44. Lee MJ, Choi JS, Cha SW, Lee KS, Lee ZW, Hwang GS, et al. Variation in the ginsenoside profiles of cultivated ginseng (Panax ginseng C.A Meyer) landraces in Korea. Proc Biochem 2011;46:258-64. Jun X. High-pressure processing as emergent technology for the extraction of bioactive ingredients from plant materials. Crit Rev Food Sci Nutr 2013;53:837-52. Masson P, Tonello C, Balny C. High-pressure biotechnology in medicine and pharmaceutical science. J Biomed Biotech 2001;1:85-8. Weemaes C, De Cordt S, Goossens K, Ludikhuyze L, Hendrick M, Heremans K, et al. High pressure thermal and combined pressure-temperature stability of α-amylases from Bacillus species. Biotechnol Bioeng 1996;50:49-56. Puri M, Sharma D, Barrow CJ. Enzyme-assisted extraction of bioactives from plants. Trends Biotechnol 2012;30:37-44. Salvador ÂC, Santos MDC, Saraiva JA. Effect of the ionic liquid [bmim]Cl and high pressure on the activity of cellulase. Green Chem 2010;12:632-5. Murao S, Nomura Y, Yoshikawa M, Shin T, Oyama H, Arai M. Enhancement of activities of cellulases under high hydrostatic pressure. Biosci Biotech Biochem 2014;56:1366-7. Lee HS, Lee HJ, Yu HJ, Do WJ, Kim Y, Kim CT, et al. A comparison between high hydrostatic pressure extraction and heat extraction of ginsenosides from ginseng (Panax ginseng CA Meyer). J Sci Food Agric 2011;91:1466-73. Ghafoor KS, Kim O, Lee DU, Seong K, Park J. Effects of high hydrostatic pressure on structure and colour of red ginseng (Panax ginseng). J Sci Food Agric 2012;92:2975-82. Shin BK. Enzymatic biotransformation of red ginseng and the compositional change of ginsenosides. J Kor Soc Appl Biol Chem 2010;53:553-8.